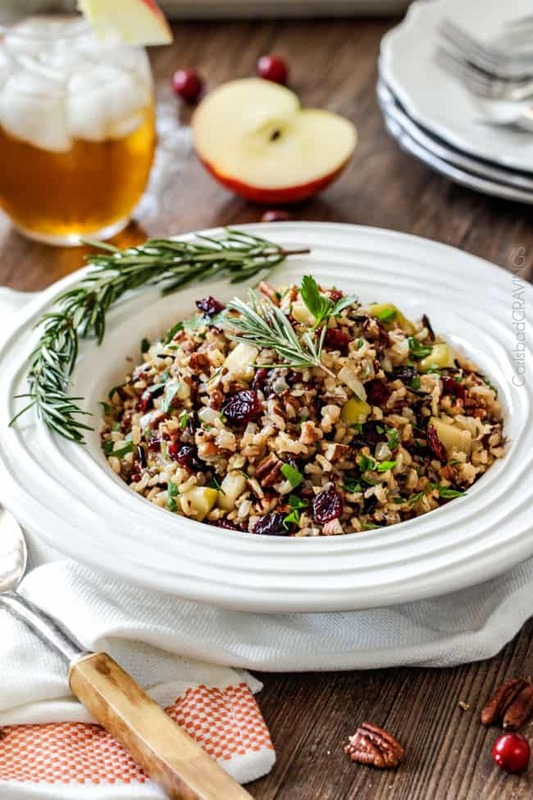 Wild Rice Pilaf simmered in herb seasoned chicken broth and apple juice and riddled with sweet dried cranberries, apples and roasted pecans for an unbelievable savory sweet side dish perfect for the holidays and easy enough for everyday! This Wild Rice Pilaf is an easy and scrumptious make ahead side dish all made in one pot! 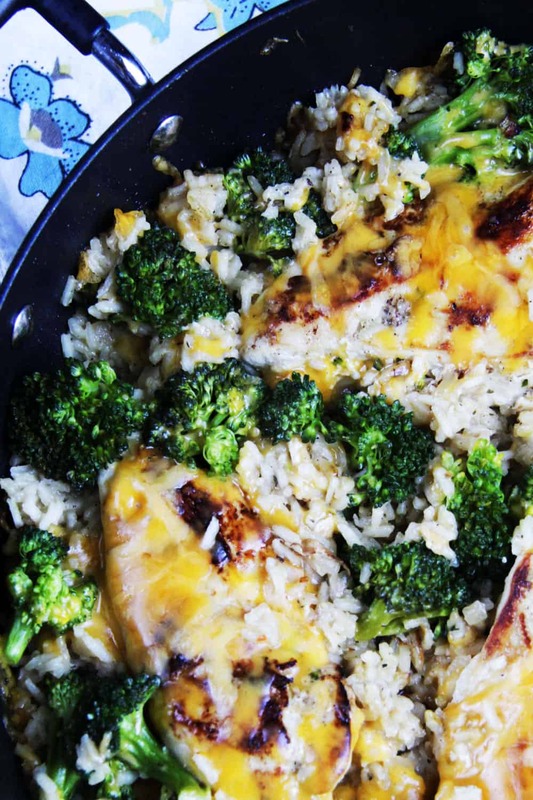 Back in my 3rd month of blogging I had the giddy idea to simmer rice in apple juice for my Cheesy Apple Juice and Dijon Chicken Broccoli and Rice Skillet. It might sound way out there – but it is positively delicious! So as I was preparing to make this Wild Rice Pilaf, I remembered my beloved apple juice simmered rice and knew just what to do. Thankfully, as I explained in my past post, I always have apple juice on hand thanks to “Pass Out Park” when Kiwi and Patrick saved my life. Apple juice is just one of the ingredients that help make this Wild Rice Pilaf so magical. It is one of the most intoxicatingly delicious rice dishes I have ever consumed. And consume I did. I was shooting two recipes the day I photographed this Wild Rice Pilaf – the rice and my Chocolate Chip Pumpkin Cake. I shot the wild rice first and the cake second, so every trip back to the kitchen, I would pause and eat more rice – I could barely tear myself away. And each time I did, I just made another excuse to head back to the kitchen for more rice. Shooting that cake took twice as long as it should have. What is the difference between wild rice and rice pilaf? Pilaf refers to both the name of the dish and the method of which the rice is prepared rather than the type of rice used. So you can use wild rice in pilaf to make Wild Rice Pilaf. I chose to use a wild rice mix in this Wild Rice Pilaf instead of basmati or other white rices because of its inherent chewy, nutty texture that is hard to overcook. 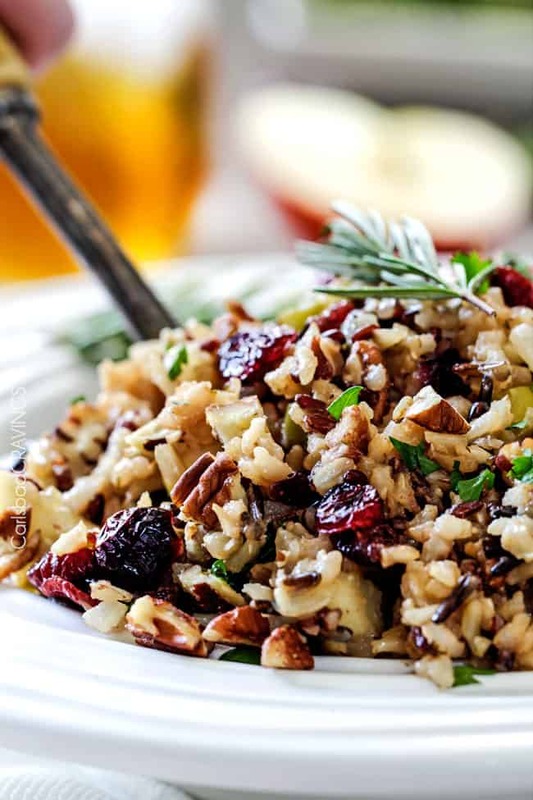 Wild Rice Pilaf remains wonderfully al dente so it not only reheats beautifully but pairs with other add-ins from nuts to dried fruit extremely well. Wild Rice looks like long-grain rice with a brownish-blackish color but it is not actually rice at all but a highly nutritious grain. It boasts a toasty, nutty, earthy flavor and is deliciously filling. Wild Rice comes from long-grain marsh grass that grows in the shallow waters of lakes, rivers, and bays. Today, the vast majority of the wild rice sold in the United States is cultivated in controlled fields similar to rice paddies. Wild rice is covered in a hard, inedible husk which has to be removed before selling, making it an incredibly labor intensive product. After wild rice is harvested, the grains are left in moist piles to mature. The Wild Rice is then toasted over a fire to dry out and make the husk easier to remove. This time consuming process and the fact that wild rice must grow in a controlled wet environment is why it remains relatively more expensive than rice and why it is often found in “wild rice blends” like we are using in this Wild Rice Pilaf recipe. What is Wild Rice Blend? This Wild Rice Pilaf recipe calls for a wild rice blend. Wild Rice Blends are an exciting blend of rices, which give you complementary firm, fluffy cooked textures and robust, nutty, earthy vibrant flavors. I use Lundberg Wild Blend Rice which is made of long grain brown rice, sweet brown rice, wild rice, whole grain wehani rice, whole grain black japonica rice. You can find wild rice blends pre-packaged in a bag, box, or in the bulk bins at Sprouts. If your wild rice package comes with a seasoning packet, you can discard that for our purposes. 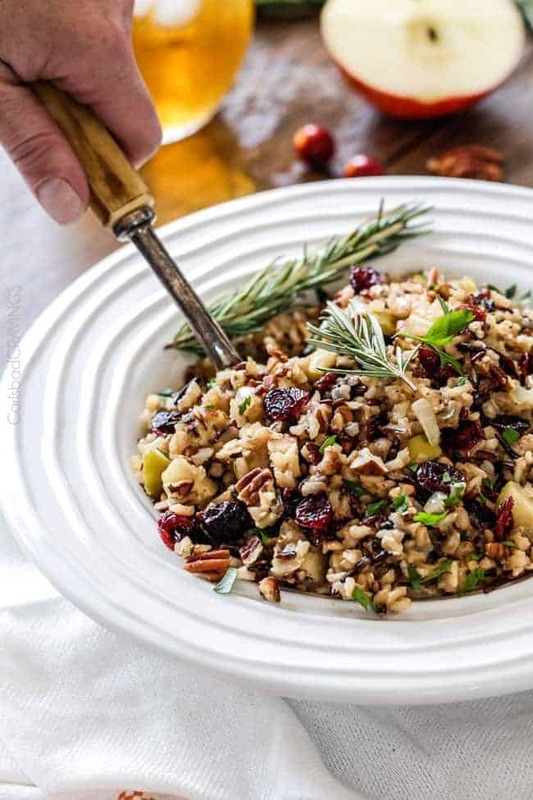 This Cranberry, Apple, Pecan Wild Rice is perfect for the holidays, company, or just to exceed your everyday deliciousness quota and even more perfect because its cooked in one pot and there is hardly any “hands on” time. It starts by bringing the apple juice, chicken broth, Dijon, butter, parsley, oregano and bay leaf to a boil then adding your wild rice. After you dump and run for about 50 minutes, you strain your rice, then to the same pot, you saute your onion, apple and garlic, then stir in some apple cider vinegar, dried cranberries, and pecans – that’s it for this deceptively sophisticated yet super simple recipe. The apple juice, Dijon, butter infused Wild Rice Pilfa is sweet and tangy, savory and buttery but not overpowering – just addicting. 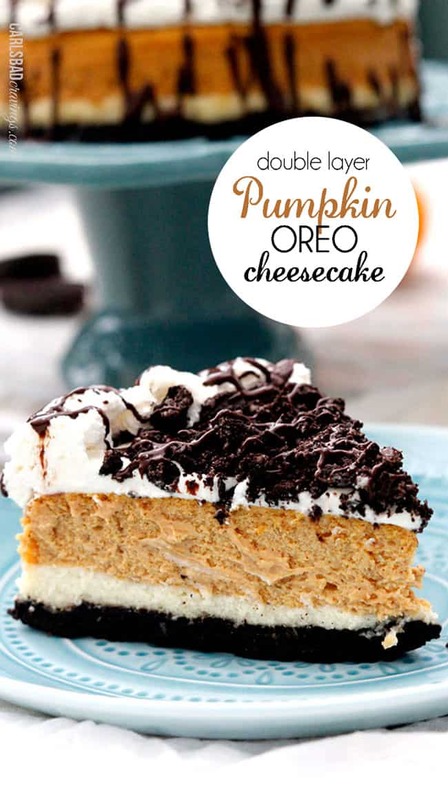 So overpowering in a different way – will overpowering – with one bite you won’t be able to stop! What Should I Add to Wild Rice Pilaf? 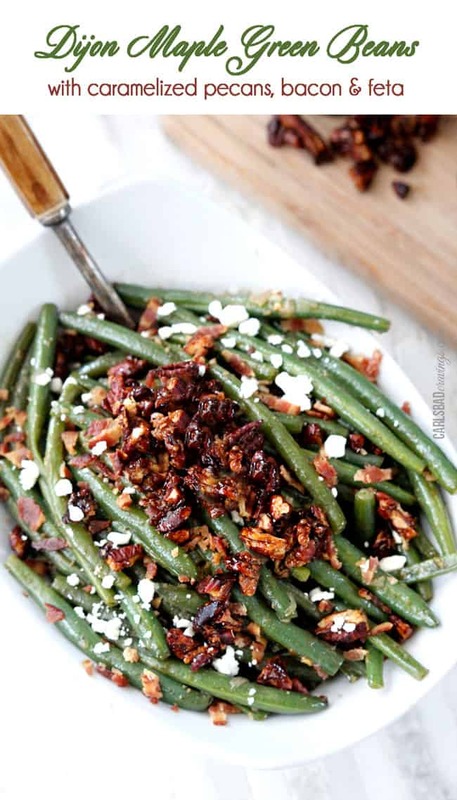 You can choose to substitute the pecans with thinly sliced almonds, pistachios or pepitas. You can substitute the craisins for dried cherries or raisins but I do recommend some sort of dried fruit to add the needed sweetness. 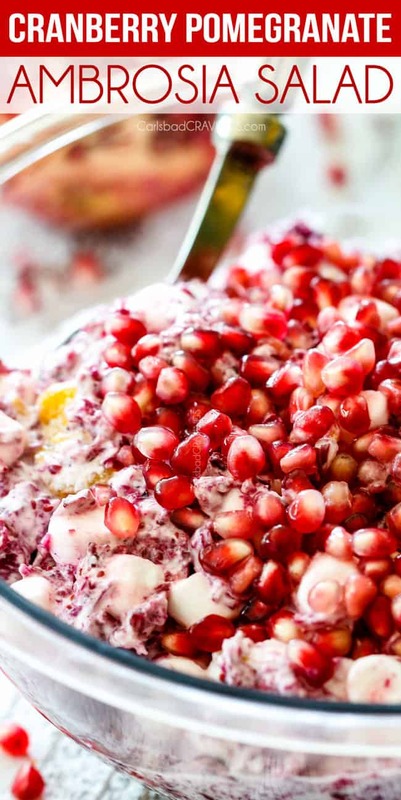 You could also add feta but be aware it will introduce more of a tangy element. Can you Make Wild Rice Pilaf Ahead of Time? Yes! 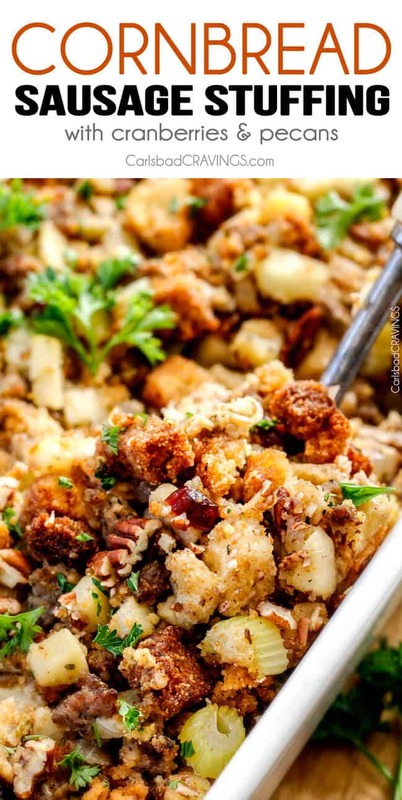 Wild Rice Pilaf reheats exceptionally well and is ideal for holidays such as Thanksgiving and Christmas. If making in advance, then follow cooking instructions except hold the cranberries and pecans and add them in when you reheat the rice. 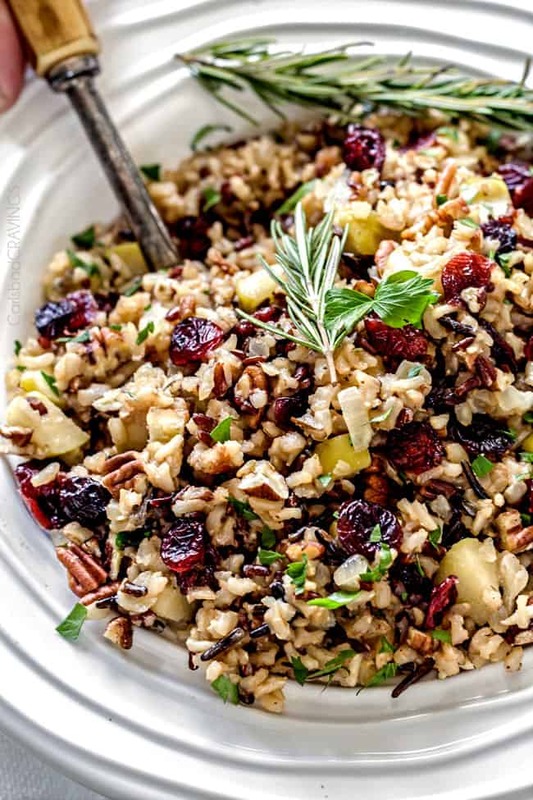 You might want to volunteer to bring the side to Thanksgiving this year but please don’t wait that long to make this Cranberry, Apple, Pecan Wild Rice Pilaf. You deserve its deliciousness sooner. Like today. WANT TO TRY THIS WILD RICE RECIPE? PIN IT TO YOUR THANKSGIVING, SIDES, OR HOLIDAY BOARD TO SAVE FOR LATER! 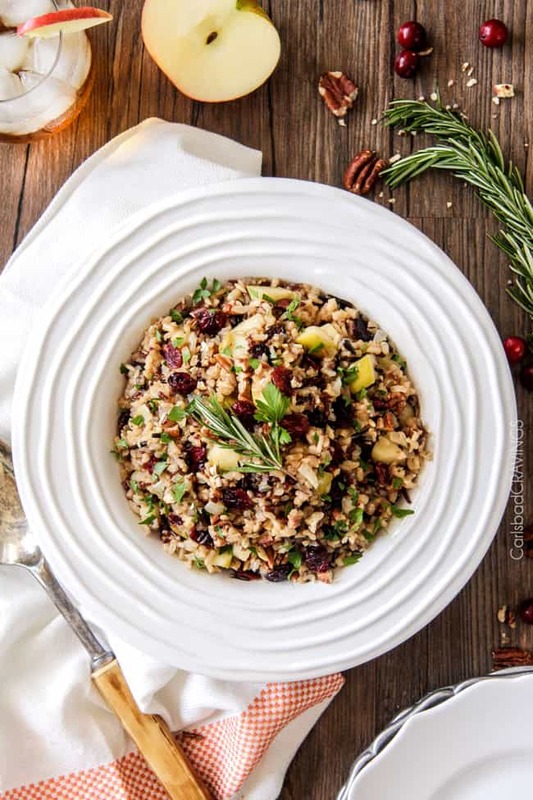 Easy one pot Cranberry Apple Pecan Wild Rice Pilaf simmered in herb seasoned chicken broth and apple juice and riddled with sweet dried cranberries, apples and roasted pecans for an unbelievable savory sweet side dish perfect for the holidays. Everyone always asks for this recipe! Bring broth, apple juice Dijon, 1 tablespoon butter, salt, pepper, dried thyme, oregano, parsley and bay leaf to a boil in a large nonstick skillet. Add rice, cover and reduce heat to low (dial should be just above lowest LOW setting). Simmer 45-60 minutes, or until rice is tender and almost all of the liquid has been absorbed, stirring occasionally and replacing lid. Add additional water if needed if rice has absorbed all the liquid and is still not done cooking. Check for doneness at 45 minutes. Once cooked, drain rice and leave in fine hole strainer. To the now empty pan, melt 2 tablespoons butter over medium heat. Increase heat to medium high and add onions and apples; saute for 5-7 minutes, or until onions and apples are tender. Add garlic and saute for 30 more seconds. Return rice to skillet along with cranberries and pecans. Add apple cider vinegar a little at a time to taste if desired for more tang (I use 2 teaspoons). Toss to evenly combine. Season with additional salt and pepper to taste. Garnish as desired. * I use the wild rice blend located in the bulk bins at Sprouts. That blend is wild rice, long grain brown rice, short grain brown rice, and red rice. I am sure anything similar will work great. Enjoy! **I have cooked this rice a few different ways. 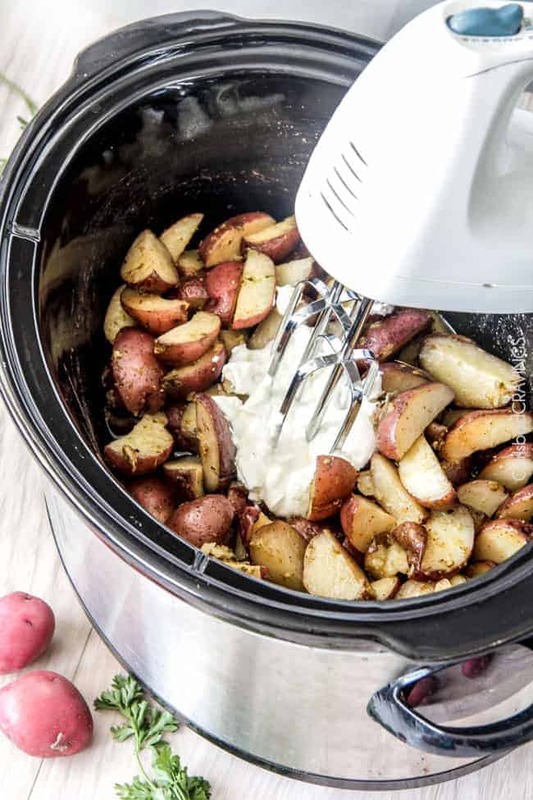 When I cooked it in my enamel cast iron skillet (as shown in the video), I cooked it on the lowest possible setting (as cast iron gets very hot) and it absorbed all the liquid within 30 minutes and I had to add quite a bit of additional water. When I cooked it in my nonstick skillet as instructed in the recipe, the liquid in the recipe was perfect. Either pan will work, but just be aware so you can improvise as needed. I have been looking for a mention of making ahead but starving chilled or room temperature. Any thoughts on that? Thank you so much. 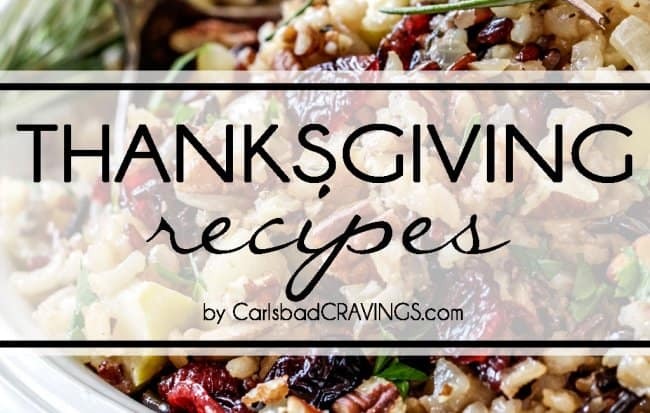 I have made it one time awhile back and knew I wanted to make it for Thanksgiving. Hi Toni, you can make ahead and serve at room temperature but I don’t recommend serving it chilled. Happy Thanksgiving!